I can’t believe the day is finally here, the new Tara Barnes Photography website is live! Through many late nights (and a few days where I didn’t leave the house…oops! #lifeasanentrepreneur) I can hardly believe the day is finally here and I am so excited to be sharing it with you today! As my business has grown over the past few years, so has my desire to create a website that clearly represents my brand. I wanted a site that conveyed the warmth and personality that I strive to achieve with my brand. I love that my new site gives you a peek into who I am as a person as well as a more in-depth view of the photography experience. Although this new website is geared towards engaged couples, I still love photographing graduating seniors. However, because engaged couples and seniors have very different photography goals, I plan to launch a separate site later this year geared towards my seniors! It might seem a little crazy to launch a new site in the midst of wedding season – I’ve been traveling every weekend since mid-May for weddings, but for me, it’s well worth burning the candle at both ends! This has been a goal of mine for a LONG time, and it still feels too good to be true! Today, I am also launching a new blog that will feature more than photography. 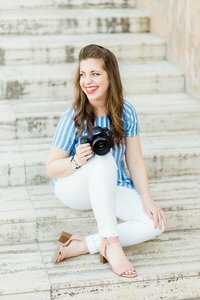 Along with my recent weddings and sessions, I plan to share resources for brides, vendor spotlights, and personal posts so that you can continue to learn more about me and the heart behind my business. The new Tara Barnes Photography site is designed and hosted through Showit5, a website platform geared towards creatives. This platform provides creative freedom and the possibilities of what you can do design-wise are essentially limitless. One of my favorite aspects of Showit5 is that the platform allowed me to design both a desktop and mobile site independent of each other. My desktop site has a few extra features, so if you are on a mobile device, I’d love it if you checked out my site on a desktop computer as well! Because I run a personal brand, I wanted to make sure there are lots of photos and information about me throughout the site. It’s very important to me that I connect with my couples on a personal level, so a big goal was to make my website a reflection of that. Another goal of the new site is to guide users through the site, rather than giving all the navigation options at once. At the bottom of each page, there are are “quick links” directing users where to go next. There is still a “Menu” tab at the upper right hand corner of the site in case you want to quickly jump to a page, but it’s a little more discreet. My all time favorite page of the site may surprise you because it’s probably one of the least visited pages on a photography website. It’s the information page! I love being able to include an in depth look into the experience I provide for my couples and I’ve also included client testimonials. This is my favorite section of the site! You can navigate through the client experience with the arrow on the right. This section is only viewable on the desktop version currently, because of the complexity of the navigation, but it’s still my favorite! If you’re on the desktop version of the site, you can check it out here. I have worked with some of the most thoughtful and encouraging couples! What better way to tell you about the photography experience than to share with you the words of couples whom I have photographed? …and there you have it! I am so excited for this new season of my photography brand. Let me know what you think of the new site in the comments section below, I’d love to hear from you!